In the Annals of the Joseon Dynasty Vol. 20 of King Gwanghae, there's this strange record that's written. Gangwondo Gansung, Wonju, Chuncheon, Yangyang, and Gangreung, etc. like sound and bright lights and smogs. The most amazing thing is that thing was floating in the air by 'some energy' and was flying.What could that possibly be? this alien who came to Joseon by UFO, 400 years ago, is still living in Seoul with the same appearance as back then? cannot even be a one little news…You never know, right?That some lovely alien might live right next door? And that if you could actually make some miraculously sweet romance with him. Min Joon has diligently observed humans for centuries, ultimately coming to cynical conclusions. Cheon Song Yi (Jun Ji Hyun) for a romance out of this world. A Nation 's fairy, A Hallyu Goddess. Brought up on frame aand wealth. When a star falls / Friendless and lonely. Who will help her pick up the pieces. her to the house is really showing your love? Ah, You hhave things to learn too. and envy to being a true friend to Song Yi. A 70-minute special episode aired on February 7th at 23:20 KST title “You Who Came from the Stars: The Beginning”. The special episode will feature Chun Song Yi and Do Min Joon’s love story from the first episode to 15th episode. All photos are courtesy of SBS Korea and SBS Global. All information, translation, fanarts must be taken out with permission. Still not find english news. 김수현 '별에서온남자' 출연 검토 중...'외계인 남성' 될까? 배우 김수현이 외계인 남성으로 안방극장에 돌아올 예정이다. 27일 스포츠 한국은 "김수현이 SBS 새 수목드라마 '별에서 온 남자'의 출연 제안을 받고 긍정적으로 검토하고 있다"고 보도했다. 이 매체에 따르면 김수현의 소속사 관계자는 "시놉시스를 받고 논의 중이다. 아직 확정된 것은 아니지만 긍정적인 방향으로 보고 있는 것은 맞다"고 전했다. '별에서 온 남자'는 400년 전 조선에 온 후 현재까지 살아가고 있는 완벽한 외모와 능력을 가진 외계인 남성과 천방지축 여배우의 사랑을 그린 이야기이다. 김수현이 제안을 받은 주인공 도민준 역은 UFO를 타고 조선에 온 후 4세기 동안 신분을 바꾸고 살아가는 인물로, 인간이 갖지 못한 특별한 능력을 갖췄고 인간의 사랑에 대해서는 냉소적인 역할이다. I'm use google translation for synopsis. Kim Soo Hyun's agency stated, "[Kim Soo Hyun] received the synopsis and is reviewing the casting offer. Although nothing has been confirmed yet, it is true that he's reviewing it with a positive mind." 'Man From the Stars' is the next production by Park Ji Eun who is the writer behind the hit drama, 'You Who Rolled In Unexpectedly'. The drama will portray an interesting story of an alien man with outstanding visuals and abilities who has been living on Earth since the Joseon dynasty when he traveled there by a UFO. 4 centuries later, he falls in love with an actress called Chun Song Yi. 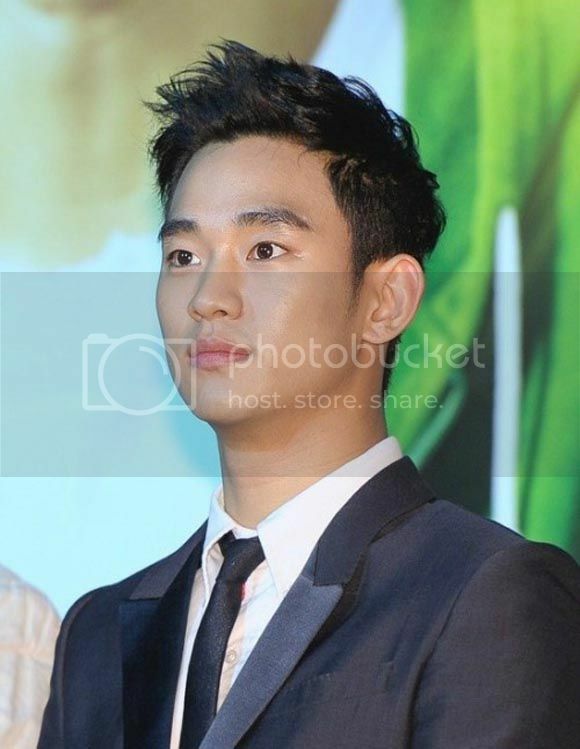 Kim Soo Hyun is in talks to take on the role of Do Min Jun, the alien. So hopefully we'll be seeing him on 'Man From the Stars', which will premiere this December! Hmm..finally..something about alien ( and I'm not talking about illegal immigrant..lol). I always wonder when korean dramas gonna have aliens in it.. The plot is seriously SO . WTF! . but the PDnim and writernim are great ( QOR , QOH and MHGAF are far away to be perfect dramas but the scriptwriter really knows how to make a perfect balance of melo and comedy and her dramas are truly enjoyable ) ... and PDnim , I have full trust on him! This casting is nowhere near final, but it is certainly worth talking about because ALIENS! TIME TRAVELING! THROUGH JOSEON! Yes, really. It Actor Kim Soo-hyun is reportedly looking at a new drama to continue his hot streak (he’s on fiyah these days, with his spy-action-comedy Covertly Grandly, not to mention his box-office-blockbuster The Thieves), and SBS has one they’d love to lure him in with titled Man From Another Star. At the center of the drama is a handsome and capable alien who first landed on Earth (via UFO, naturally) 400 years ago during the Joseon era, who lives through to the current era when he falls in love with an actress. How is this NOT going to be awesome? Wait, don’t answer that. But it’s such a wacky premise that I can’t help but want it to be a smash hit. In the way that it succeeds, I mean, not in the way that I want to smash and hit things. This could be a great role for Kim Soo-hyun, who has tried his hand (and succeeded) at a variety of genres already. We know he can do sageuk (Moon/Sun) and melodramas (Will It Snow for Christmas, Giant, Father’s House), and he’s got a lovely groundedness to his dramatic acting. On the other hand, he’s also got a mischievous streak a mile wide and is great with comedy too (Covertly Grandly, Dream High). He’s perfect for this! The only other option who might be better is Kim Woo-bin… and now I want them to play time-traveling alien brothers. Pretty please, SBS? Granted, this drama sounds a little bit Rooftop Vampire Idol Alien In-hyun’s Man Has Faith, and we’ve seen these plot parts in many a drama already. But here’s proof that while there is nothing new under the sun, you can make something old fresh again by dressing it up with just the right tweaks. Writing is Park Ji-eun of the zippy and popular weekend series You Who Rolled In Unexpectedly, so we can expect light funnies, while PD Jang Tae-woo has more serious fare under his belt (Tree With Deep Roots, Painter of the Wind) that’ll come in handy for the sageuk bits. Man From Another Star is being prepped as a Wednesday-Thursday drama for SBS later this year. Finally!!! Finally!!!! I finally receive some news updates about KSH's upcoming drama. So, it is just a rumor, not yet confirmed for KSH to be in this drama? Hmm...Anyway, looking forward to another new creative drama created by Korean entertainment! Movie actress Jeon Ji Hyun's comeback has drawn attention. According to the reports, the producer of SBS Man From The Stars is courting Jeon Ji Hyun along with her Thieves co-star, Kim Soo Hyun. No confirmation has been made as of now. Man From The Stars is a story of an alien man, Do Min Jun who lived during Joseon dynasty. He will travel thru UFO and falls in love with an actress 400 years later. This will be written by Park Ji Eun (You Who Rolled In Unexpectedly) and is set to premiere on December. Kim Soo-hyun and Jeon Ji-hyun together again? For an entire drama? This could get interesting. Word is that the new SBS aliens-time-traveling-through-Joseon drama Man From Another Star is courting The Thieves co-stars for an onscreen reunion. The drama is still many moons away (it’s slated for winter) so it’s just a round of casting offers at this point, but the possibility of Jeon Ji-hyun’s return to dramaland is getting a lot of attention. Given that their first project together was such a hit and the fact that their loveline in the film was short and sweet enough to keep people wanting more, it would be a smart move to score them both. Not that wrangling two movie stars back to dramaland is an easy feat. Jeon Ji-hyun’s last drama was 1999′s Happy Together, and she has since been sticking exclusively to movies for the past 14 years. I thought they had great chemistry in The Thieves, and wouldn’t mind seeing them get their happy ending in a drama, that’s for sure. The new project from the writer of You Who Rolled in Unexpectedly and the PD of Tree With Deep Roots is about an alien who travels back in time and lands in Joseon, and then lives through the next four hundred years to the present day where he falls in love with an actress described as reckless and brazen. Oh, the wacky. There are so many ways this could be awesome, starting with two solid leads to anchor the romance. What are the odds that a time traveling alien sageuk will be the ticket? Man From Another Star is being planned for a December premiere on SBS. Kim Soo-hyeon and Jeon Ji-hyeon's reunion? While actress Jeon Ji-hyeon might be coming back with a drama, many wonder if she will reunite with actor Kim Soo-hyeon-I. Jeon's agency claimed on the 10th that, "She's been offered a role in the new SBS drama "Man From the Stars" but she hasn't received the script yet". "She has thoughts to star in a drama if the chance is right but nothing is set. She's looking at both movies and dramas". "Man From the Stars" is written by Park Ji-eun and it's about a man who time travels from 400 years ago falling in love with an actress and it's produced by Jang Tae-yoo from "Deep-rooted Tree". If Jeon decides she'll do it, it will be her first drama come back in 14 years since the 1999 drama "Happy Together". Kim Soo-hyeon has already been confirmed in the role of the male character Do Min-joon. There is still no confirmation from KSH's agency KEYEAST yet. but already various blogs and media sources confirmed the role for him on his behalf??????!!!!!!!! I am excited for his comeback. KSH fighting!!!!!! I am visiting this thread from time to time just to catch any updates regarding the drama. I hope KSH and JJH will accept the offer. They have a good on-screen chemistry in The Thieves.